You are here: Home / Sewing Challenges / 2019MakeNine / The CSC tackles the 2019 Make Nine Challenge! 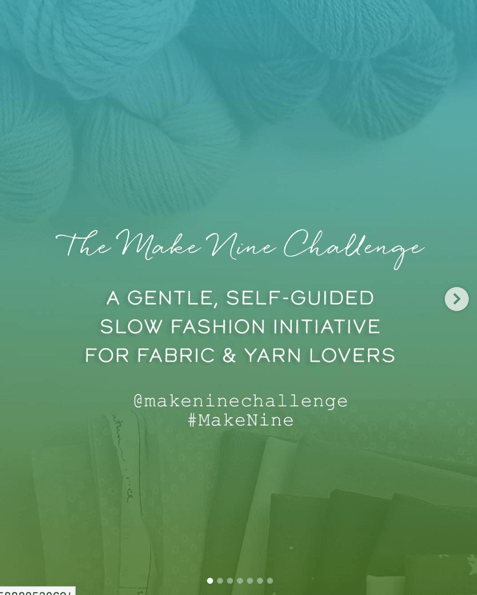 While the CSC doesn’t currently have any plans to host any theme months or ongoing sewing challenges in 2019, several of our editors and regular contributors will be participating in the Make Nine in 2019 Challenge. The Make Nine challenge is an annual year-long “making” challenge hosted by Rochelle of Lucky Lucille with the simple rules of picking nine projects to “make” in 2019–they can be sewing, knitting, or other craft projects, and your list of nine can be as specific or as unstructured as you like. Post your plans and progress along the way to Instagram with the tags @makeninechallenge and #MakeNine2019 to participate. To kick things off, we thought that we’d use this post to share our own plans and provide a little inspiration for this year’s Make Nine Challenge. I view the Make Nine list as a nice set of guidelines and not a list carved in concrete. I don’t know about you, but my tastes change and the things I want to make change with it. Sometimes I feel like making all the “not on the list” things, and so the list gets completely forgotten until the end of the year. My track record of completing the make nine challenge is zero. One year, I made nothing, another 1/9, and last year I made 3/9. I also tried to switch this up to fabrics last year to focus on sewing my stash. I sewed a lot of fabrics that weren’t on that list. Ottobre coat Autumn/Winter 2017: I plan on adding a fake fur trimmed hood to it (possibly detachable) and possibly adding a scallop detail to the coat. I have some lovely light blue wool to use. I will interline it with thinsulate to make it super warm. 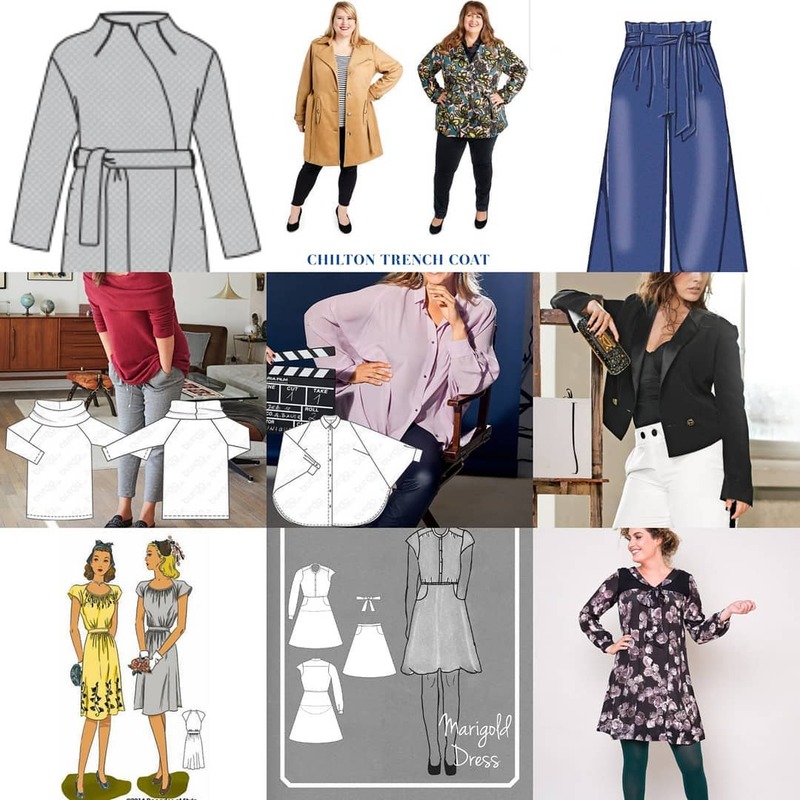 Cashmerette Chilton Trenchcoat: When my sewing machine died earlier this year, I was actually testing this pattern. I have it cut out already in some poly twill and the lining (nylon/waterproof) sewn up in the tester version. I just need to compare to the final version and make some changes. Burda Off the Shoulder Sweater: I plan on making this ASAP in some hacci knit. If I like it, I will probably make two versions in different colours (purple and turquoise). Burda Oversized Blouse: I just love this blouse! I have tons of fabric that would be appropriate for it in my stash. Burda Spencer Jacket: This jacket rocks and totally fits in with my goals of making some statement pieces. How cool would this look paired with an ombre dyed long tulle skirt? Decades of Style Dorothy Lara dress: I will need to grade this pattern up and do an FBA, but it shouldn’t be too difficult. I love the style of it and hope it looks as cute on me as it does on Tanya. I have some rayon watermelon fabric that I plan on using for it. Blank Slate Patterns Marigold dress: This pattern was recently expanded for larger sizes and I love it. I have some red floral rayon fabric for it. This is silk chiffon for a blouse and green linen for a skirt, but I’m waiting to see if a pattern is released this year that will work for either or both! Wool jersey from The Fabric Store to make a cowl necked Cashmerette Washington/Turner style dress. The ever popular McCall’s 6696 and snail print lawn. Vintage cotton fabric with a choice of a couple vintage dress patterns. Decades of Style Dorothy Lara Dress with some striped shirting from deep stash. More vintage, both pattern and the cold rayon fabric. This is the year I WILL make a Christmas apron. My plan for my Easter dress. Vintage textured cotton and either a true vintage pattern or a reproduction. Sewaholic Gabriola Skirt with striped chambray that is also from my deep stash. For my Make Nine I decided to narrow down my choices (I’m not great with choices, don’t stand behind me at a buffet!) So, one of each style of garment (skirt, pants, tee etc), using, where possible, nine patterns I already have. Even better, hopefully made from fabric I already have. I nearly made it, just one pattern to buy. Concord tees from @cashmerette , I love a good tee, but it has to be long enough, and preferably have elbow length sleeves please. A McCalls #M7475 skirt, in a beautiful barkcloth. The only pattern I need to buy, the Sasha pants from @closetcase.patterns , I’m thinking a navy cotton with a bit of stretch, and a mustard version of course. I’ve been watching everyone’s Make Nine plans pop up on instagram and blog and thinking to myself… I surely don’t need nine new clothing items. Of course we all know that I will definitely make more than nine things next year (see my 2018 Year in Review post about how I made 56 items for myself last year), but I wanted to challenge myself to be a bit more sustainable in my sewing next year. The idea is to remake (at least) nine items in my closet. This will include replacing me-made or ready to wear items with newly sewn items AND fixing, mending, or altering items in my closet to make them wearable again. The key is that I then have to donate, scrap, or trash the item I replaced, thus making sure that I’m not adding any new items to my wardrobe. A few friends on instagram have decided to play along on the #RemakeNine2019 challenge, and you are welcome to join in as well. Here are the nine items I’ve selected, you can find way more details and photos of the items I plan to remake or fix on my blog. 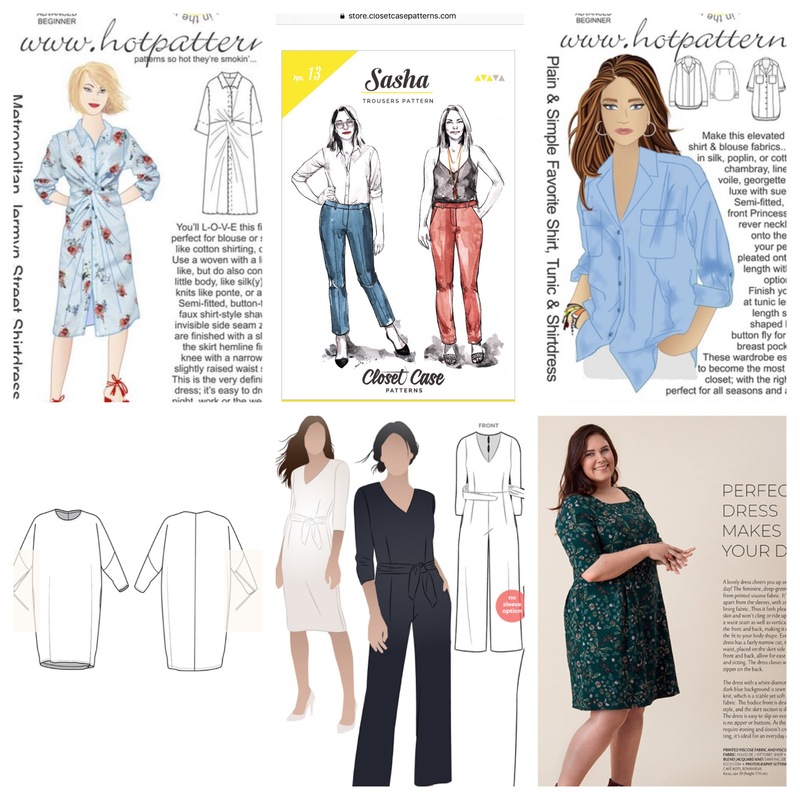 I decided to go with a theme of sewing from my pattern stash (new and old) for this challenge. 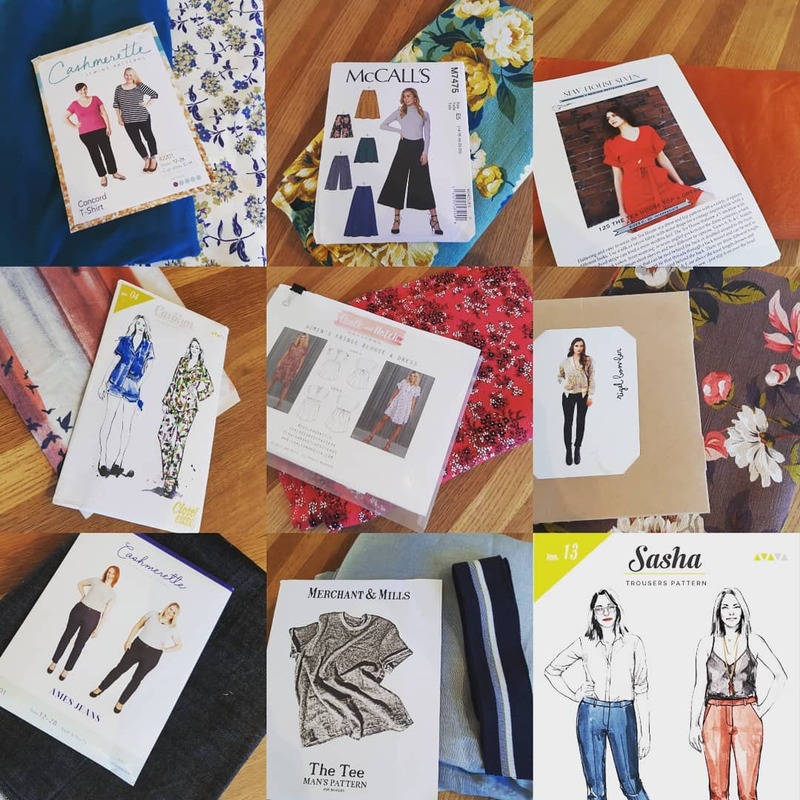 Narrowing my choices down to nine patterns proved to be a real challenge, so I’ve created a list of twelve patterns that I already own and that I’d really like to sew this year, with a goal of sewing any nine out of my list of twelve. For my 2019 Make Nine, I chose to look at the type of garments I wanted to make, rather than choosing specific patterns. I wanted some flexibility in the plan because that gives me the permission to switch out a pattern if it doesn’t work. I’m also looking to up my sewing game with advanced techniques. I’d like to make several pairs of jeans. The main focus is on the inseam length. I also want to make leggings that are snug around my ankle. The other staples I’m looking to make include a wrap dress, cardigan, blazer, summer tank, and a full skirt. I chose the button up shirt because I’ve been wanting to make one since I started sewing. I’m also dreaming of a romantic blouse with some sort of drama to it. These are all pieces that fit in my current lifestyle and will elevate my wardrobe. I’ve been participating in the Make Nine challenge for a few years now and I never complete all of the items on my list. Last year I came close with only two left uncompleted (A1683 and V8333). I added those two to this year’s list and hope that this is the year that I will finally make a tailored blazer. 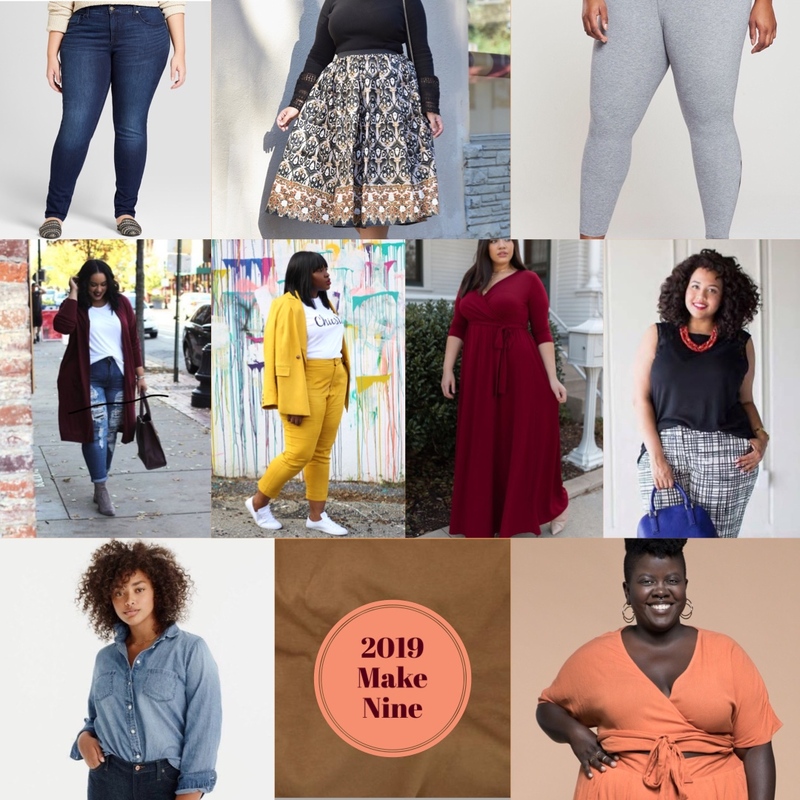 I look at the Make Nine as a goal and try to pick pieces that go with my current aesthetic and will fill areas of my wardrobe that I feel are lacking. I also like to choose patterns that I haven’t sewn before and sometimes that’s a little push for me to make it. Last year I swapped one pattern for another that was similar and I wouldn’t be above doing that again. Advance 1683, vintage 1930’s (return pattern). I’m planning to make view two out of a vintage 1930’s/40’s Egyptian print rayon in blue/brown, paired with a matching brown rayon. I already have a name for this dress (and matching shoes! ), if I ever get around to tracing it out and sewing it…. Hollywood 942, vintage 1930’s. I don’t know which fabric I will use for this yet, but I plan to make the caped sleeve version. I did just purchase a vintage 1930’s deco print cotton which might work very well for this dress. Vogue 9295, repro 1940 design. My closet lacks winter dresses that are not knits, so I’ve been making an effort to sew dresses appropriate for cold weather. I have a vintage 1940’s cold rayon in charcoal grey with white polka dots waiting to be made into view B of this pattern. Vogue 8812, repro 1940 design (OOP). I have actually made this pattern before, so it breaks my “rules”, but I haven’t made the bolero and I haven’t sewn this dress with my advanced skills, so I’m looking forward to sewing it again. I have a multi-colored plaid cotton waiting to be made into this summer dress, but I haven’t figured out a fabric/color for the bolero. Vogue 1171, repro 1950 design (OOP). I’ve been wanting to sew this pattern for a while, but was a little trepidatious as I saw a negative review for it. I’ve since decided that it might be different for me as I have a different body type than the reviewer, so it won’t look the same on me. I’m undecided about fabric, but I have a lot of cottons in my stash that will work for this. Vogue 8333 (return pattern). This one returns again. I already have some exquisite navy wool suiting and vintage silk for this pattern, along with fancy gold buttons. What’s missing? Me actually deciding to start work on it. Ottobre 2/2018 Norma Blouse. I have yet to sew an Ottobre pattern and admittedly I’m lazy about tracing patterns, especially when they come with a squirrelly map like this, but I love almost every pattern in this issue. I think the Norma will be a nice blouse that will go with jeans and skirts and fill the void of coordinating separates that I have in my closet. Closet Case Jenny Trousers. I was in love when this pattern came out as I had already sewn two other patterns trying to get the 1940’s/50’s high waisted jean that I covet. There is a maker of retro jeans in this style that I covet, but they don’t come in plus sizes, so I’ve been attempting to recreate them. This pattern with some modifications will work well. I’ve already made a muslin and am planning at least two pairs this year. 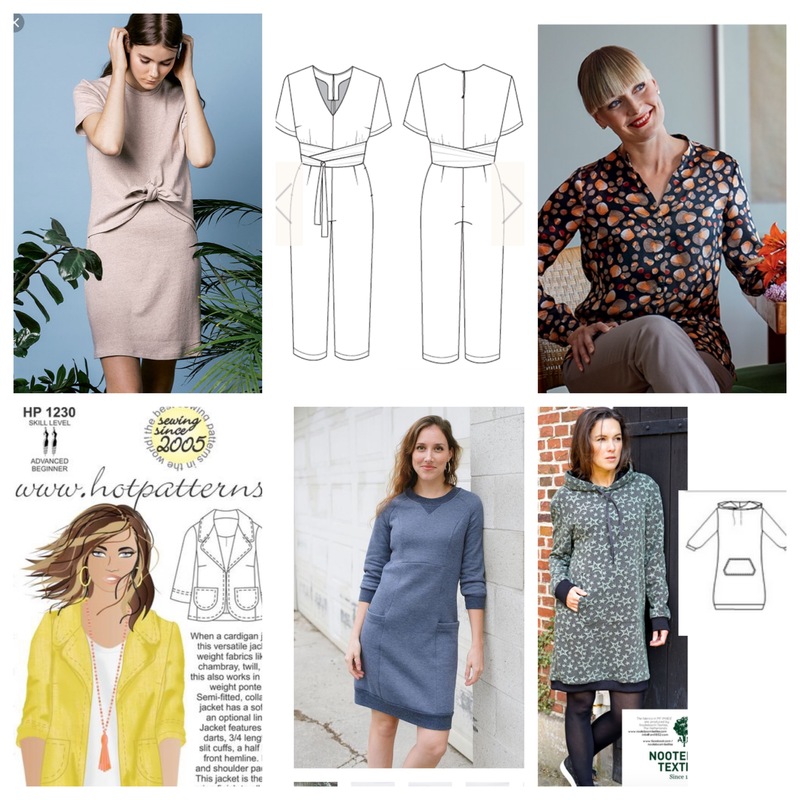 Butterick 6019. This is not usually my style, but I’ve wanted an Alfred Shaheen sarong dress for a while. This pattern by Gertie should work well for me with some alterations. All it’s really missing is the scarf/sash. I already have a vintage 1940’s orange Hawaiian rayon waiting for this. Are you participating in the #MakeNine2019 challenge? How did you determine which “nine” to pick? If you’re participating, please share your plans and IG handle in the comments section of this post! Wow, this is awesome, What a great way to motivate me to get more sewing time in. I’m super excited. I’m going to pick my 9 this weekend and get started ASAP!!!!!!!!!! I decided on a really unstructured list for Make Nine this year — more concepts than specifics, mostly of things I wanted to sew or needed, like “something with a square neckline” or “simple trousers.” I tend to change my mind about what pattern to use at the last minute, so I decided to keep it vague. I mean, they’re still goals…just less specific ones. I’m looking forward to following these projects – I live vicariously through keeners. I will be working on my own #MakeONE2019 project. LOL! I’m doing the Make Nine Challenge for the first time as well. My plan has items that I’ve wanted to sew for a while, but tabled because…squirrel! So far I don’t feel limited by or pressured to do the challenge. I’ve seen at least three hashtags floating around IG: #MakeNine2019, #2019MakeNine, and #MakeNine (in order from what appears to be most-to-least use). The hashtag listed on Lucky Lucille’s page is #MakeNine. I don’t know if she monitors the other two. It is really motivating seeing all the ideas others have to make 9 over the next year. I have one skirt on the go, one quilt on the go, and already made one skirt January 2019. 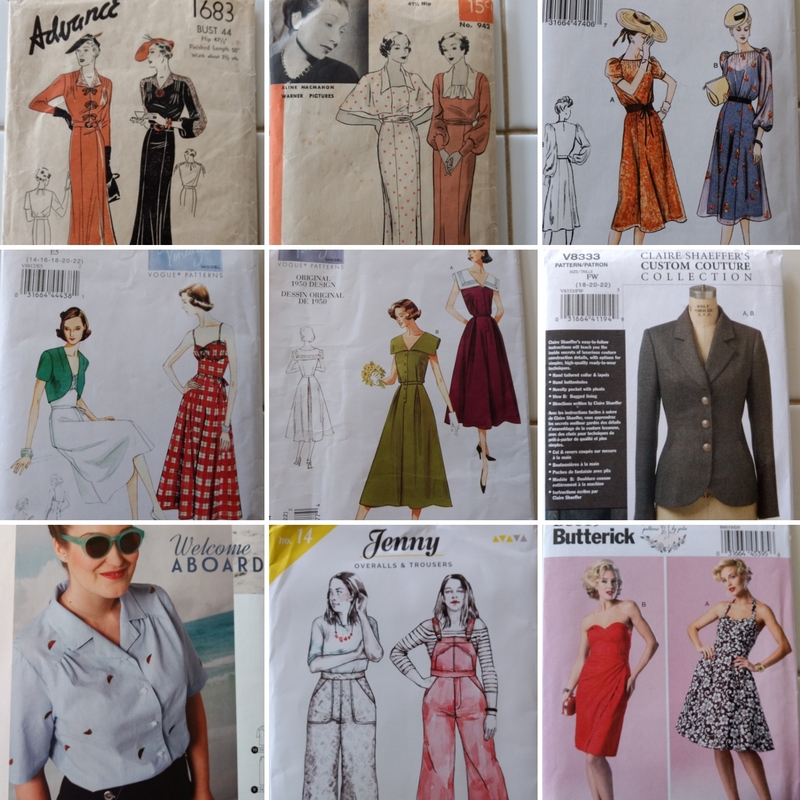 I have the patterns and fabric for another 4 dressmaking projects. My goal this year is to do more dressmaking and less quilting. Now I will think ahead and plan a range of projects to make up to 9. Wish me luck.